The FoodSaver V4840 Vacuum Sealer has quite obviously been made with a lot of consideration having been given to the frantic lifestyles that people lead today and it has quite clearly been designed from the outset to be easy and convenient to use. This vacuum sealer system has built in roll storage and a bag cutter, a retractable hand held sealer, a removable drip tray, and moist/dry food settings too. With so many features and functions, the FoodSaver V4840 makes packing and storing food a breeze. When it comes to food storage appliances, the FoodSaver V4840 is definitely up there with the best vacuum sealers on the market. In this article, we give you our detailed review of the FoodSaver V4840 Vacuum Sealer, we look at the pros and the cons of this model, and we give you a step by to guide on how to use the FoodSaver V4840. The completely automated V4840 vacuum sealer is so simple to use that it is practically fool-proof. Simply place the food into a FoodSaver heat-seal bag and then gradually insert the open end of the bag into the vacuum channel of the machine. The unit will automatically start vacuuming out the air as well as sealing the bag instantly. With built-in roll storage along with a handy cutting bar, the machine can also be used to produce custom-size bags. This counter top appliance is sleek, fashionable, and very easy to use. You can save time in the kitchen by cooking food in large batches and then keeping small portions for use through the week, you can freeze big cuts of meat, and much more. Using this FoodSaver system you can save space in your refrigerator and freezer too, because vacuum packed food is so much smaller than food kept in regular packaging. It is very fast and economical. 2 in 1 sealing system makes it to be suitable to be used with a variety of types of packaging. The removable hand held sealer is ideal for use with zip bags and storage containers. It automatically identifies the bags, so no manual intervention needed. It’s easy to vacuum seal canisters, containers as well as jars with the attached portable sealer. It’s not very good for packing and storing liquids. Some people find the automatic features a bit inflexible. 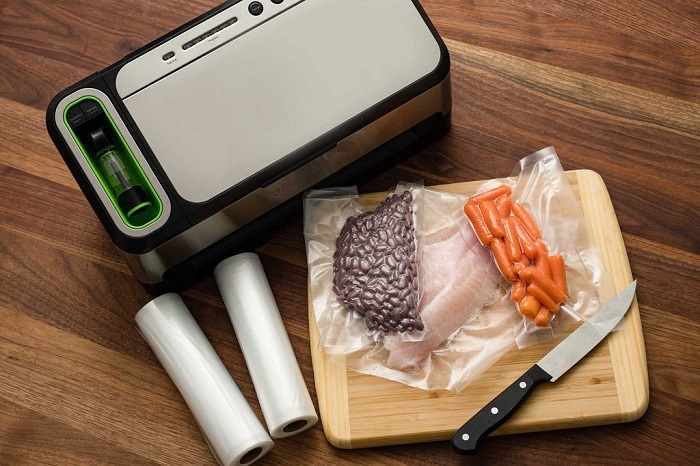 We are big fans of this vacuum sealer. This vacuum sealer has a few small drawbacks as you will find when you look at the customer reviews. However, by far the majority of users say that they are really pleased with its overall performance. We think that the V4840 vacuum sealer is great for daily storage purposes and it is also great for marinating meat for things like a barbecue party. For added flexibility, the counter top appliance comes with a retracting hand held sealer, which removes the air from just about all FoodSaver bags and containers as well as FreshSaver freezer bags and storage containers. Simply insert the open end of the bag into the vacuum channel and the machine will sense and then grasp the bag, vacuum, seal, and then it will shut-off again instantly when the bag has been sealed. Handheld sealer works together with all types of FoodSaver bags, storage containers. The system has an extra secure and airtight seal that is twice as wide as most other vacuum sealers, which gives a more reliable and consistent seal. It marinates beef, chicken, seafood, tofu, or veggies in minutes rather than hours. 1. Open the appliance door and place the roll into the roll holder. For the best results, insert the roll so that the bag material feeds from the bottom. 2. Feed the material through the appliance and then lift up the cutter bar and place bag material underneath. 3. Feed through enough bag material to hold the food item that is to be stored, plus about 4 inches (10.16 cm) extra. Lower the cutter bar and cut the bag to size. 4. Push the sealing button and a red-coloured sealing indicator light will light up. 5. Place the food into the bag and then, using both hands, slowly place the open end of the bag snugly into the vacuum channel until the clamp comes down and the vacuum motor starts. 7. Now you should have a perfectly sealed bag, so you are ready to start making full use of your FoodSaver 4840. The FoodSaver 4840 2-in-1 Vacuum Sealing System can indisputably be called one of the best vacuum sealers available on the market. With its huge range of functions, it provides you with a stress-free vacuum sealing experience in the kitchen. Not only are its features excellent, it is also far superior in quality than many other vacuum sealing systems in the same price range. It is possible to save a lot of money through buying your food in bulk, and then storing the food by using this vacuum sealer to keep the food fresh, tasty, and freezer burn free. The FoodSaver 4840 is well worth investing your hard earned money on, because in the long run, it will pay for itself, over and over again. want to…HaHa). You definitely put a fresh spin on a topic that has been written about for decades.